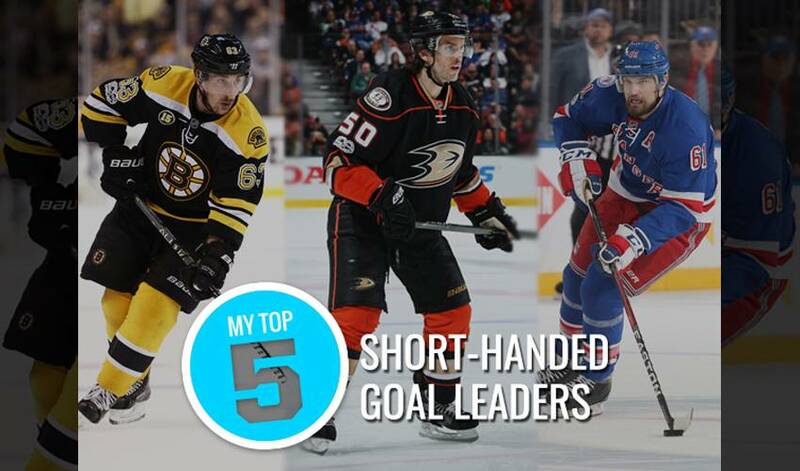 If you happen to be a man (or two) down, you might not be on the short end of the stick when it comes to these five players. Who holds the distinction of having the most short-handed tallies? Hint: three players share top spot on the list. Boston’s superstar left winger has nine short-handed goals over the past three seasons. The 29-year-old topped the category with five in 2013-14, a season in which Marchand also recorded five game-winning goals. Just 11 games shy of 1,000 for his stellar NHL career, Nash, who has 416 regular season goals, tallied five short-handed goals – a career-best mark in the category – in 2008-09 with the Columbus Blue Jackets. In 2005-06, his first full NHL season, Vermette notched six short-handed tallies. The Quebec native netted 13 of his 22 short-handers during his time with the Ottawa Senators. He also has seven career short-handed assists. Montreal’s veteran centreman contributed a pair of short-handed goals in 2016-17. Plekanec has eight man-down markers over the past four NHL seasons, including three in both 2013-14 and 2014-15. A three-time Stanley Cup winner, the 40-year-old centreman has netted five short-handed goals over the past two seasons. Cullen also has 16 career short-handed assists since he broke into the NHL in 1997-98.